In 2019, Canada will commemorate the 75th anniversary of D-Day and the Normandy Landings. This milestone anniversary provides an excellent opportunity for travelers to take part in a pilgrimage trip to France to experience the Canadian sector firsthand and walk in the footsteps of history. 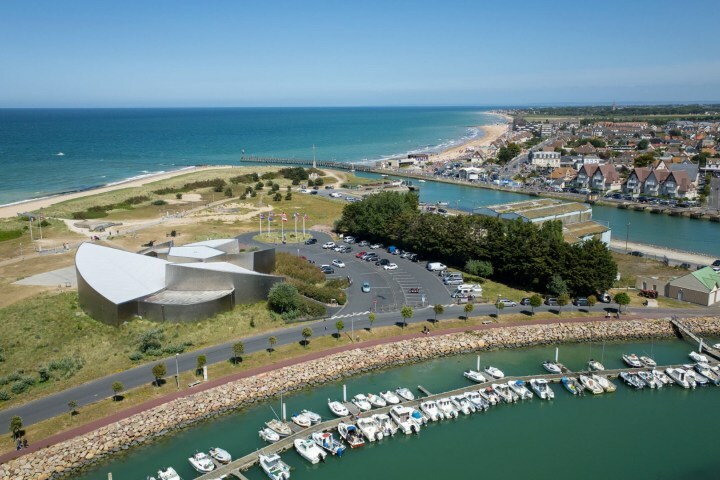 The Juno Beach Centre is Canada’s Second World War museum and cultural centre located in Normandy, France. Opened in 2003 by veterans and volunteers with a vision to create a permanent memorial to all Canadians who served during the Second World War, the Centre’s mandate is to preserve this legacy for future generations through education and remembrance. The Centre pays homage to the 45,000 Canadians who lost their lives during the War, of which 5,500 were killed during the Battle of Normandy and 359 on D-Day. Planning a trip to France? The Juno Beach Centre’s staff in Canada and France is pleased to help travelers make the most of their time in Normandy and take advantage of the historical and cultural richness offered in the region. Whether you have a week or just a day, there are many ways to explore the Canadian sector of Juno Beach, either on a self-guided tour or as a short jaunt from Paris, London, or beyond. The Centre is located in the coastal town of Courseulles-sur-Mer, a short drive from the city of Caen or Bayeux and just two hours by train from Paris. Visit our website for helpful tips on how to make your way to the Centre by car, ferry, train, or public transit. There are a number of high-quality tour companies that also offer day trips to the Canadian sector, including stops at the Juno Beach Centre and other important sites around the region. Some companies offer tours from Paris, or they can pick you in the region. In many cases, these tours can be customized based on your timeframe and even your own familial history. Check out our list of recommended tour companies and helpful tourism links. You can also book an excursion from a Seine river cruise. More and more cruise companies stop in port cities like Cherbourg and Le Havre and offer excursions to the sector and the Juno Beach Centre for their Canadian passengers. No excursion to the Canadian sector offered? Insist on one! Cruise companies will only create the offer if there is a demand. Normandy is a very bicycle-friendly region. Follow in the footsteps of Canadians from Juno Beach all the way to Vimy Ridge with the Maple Leaf Route Cycling Tour, a publication of the Juno Beach Centre. We hope this information is helpful to you! We’re always thrilled to welcome Canadians to the Juno Beach Centre. If you’re planning a visit to Juno Beach Centre, our tour schedule is available on our website. There is no need for individuals or groups under 10 people to book in advance and we’re open daily, aside from the month of January. Visit our website for more details or send us an email if you need any further advice or recommendations. We look forward to welcoming Canadians to the Juno Beach Centre in the near future, and as we like to say, See you on the beach!